Pick up the quest from Arcanist Thelis (Scryers) or Anchorite Seyla (Aldor). 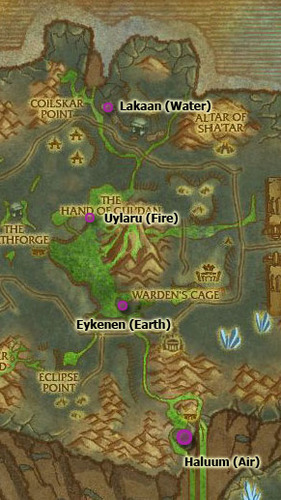 They're located in respective faction camps in Shadowmoon Valley. 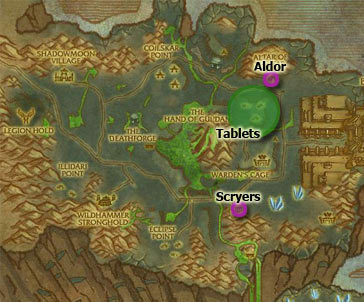 They want you to go fetch 12 tablets from a very densely populated camp located at the green circle (see map) - be advised that you need to be careful, or you will pull a ton of mobs, literally. Although it's not a group quest, it can be nice to have a friend with to deal with possible mishaps. 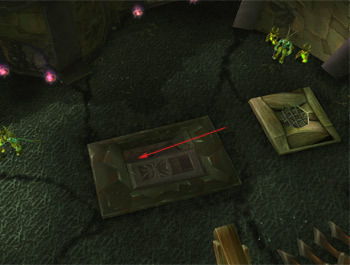 They can be found directly on the ground, and as drops from the mobs in the area. +250 rep.
After having returned "Tablets of Baa'ri" to the original quest giver, you'll be asked to have a 'chat' with Oronu the Elder. He's located on a big balcony in the very North West of the camp you visited to fetch the tablets, you can basically just fly there and land right on top of him without ever having to fight any other mobs. He's a shaman, with lightning shield, grounding totems and the ability to heal himself - yet extremely easy to kill (on your own), so don't worry about it. Kill him, loot the orders and return to the quest giver. 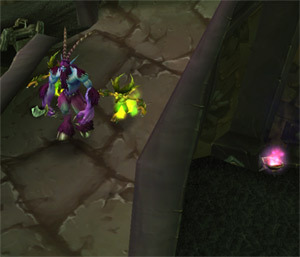 +250 rep.
You're now asked to gather 4 medallion fragments from 4 different locations in Shadowmoon Valley. They are being held by shamanistic mobs, and they all have different abilities. Suffice to say that they are rather easy, and you should be more than fine with soloing these. They will typically be in areas where there's a lot of normal elemental mobs striding about, so you might want to clear a little around them before engaging these shamans. There's not really any need to explain these mobs, because they're so easy, but I'll do so anyway for those interested. You will need to kill the three totems keeping up his shield, until you do so he'll be immune to all forms of damage. Every time you kill a totem, two water elementals will spawn which will have very low HP, they cast frostbolts which may sting a little, so just kill them fast before you continue bashing the next totem. Once the last totem is destroyed, he'll be unleashed. Like the water elementals, he'll cast frost bolts at you. Kill the small elementals, then him (don't forget to loot) and continue to the next location.. Unlike Lakaan, Uylaru has no shield protecting him, so you can just kill him right away. To get out of combat afterwards you will have to kill the totems, and every time a totem dies, it does a fire nova. It has a few seconds casting time, so you'll have enough time to take a few steps back to avoid it. A few Fire Elementals with incredibly low HP will spawn for each totem you destroy, might want to kill them before picking a fight with the next totem. This guy has Earth Shield which heals him when being hit (can be purged). Kill him, kill the totems. As expected, Earth Elementals will spawn for each totem you kill. Just as Lakaan, this fella' is being shielded by his totems, so you'll need to kill them first. The Air Elementals that spawns for each totems hits moderately hard, try to kill them reasonably fast. Haluum himself has Lightning Shield and Chain Lightning, but as the other three shamans, he dies very easily. 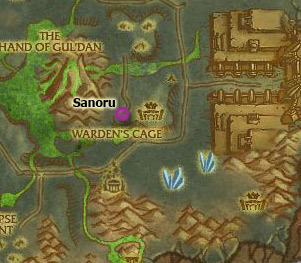 You are now to find Sanoru, located at the Warden's Cage in Shadowmoon Valley. He's taking residence underground, you'll reach him by using a rather small ramp. You can fly down this ramp without aggroing the big monster guarding the entrance. Don't fret over it if you happen to engage this mob, just continue down the ramp and kill it once you have done so. Sanoru is just below this ramp, turn the quest in and you will recieve your next mission. Go upstairs again and mount up. If you turn your eyes to the top of the big wall surrounding the place, you'll notice a big purple Satyr walking on top of it, accompanied by two small imp minions. There's nothing special about him really, just kill the imps which have very low HP, kill him, and you're done. Head back underground, past Sanoru, and take next one on your right hand side. Jump into the water, swim to the bottom and continue south, and get back up to the surface. You'll end up at Akama, a very grim looking Ashtongue Deathsworn who just happens to be just the guy you're looking for - when you turn in the quest, a small event will take place, where you're being sacrificed in front of one of Illidan's watchmen. Just stand still and wait for it to be over, and pick up the next quest once it is. Sidenote: It might be interesting to take a peek through the prison door behind Akama. This guy is located inside Arcatraz, at the place where you will find three packs of Etheral mobs - it's quite close to the end. It doesn't matter if you're doing it on heroic or normal instance mode. Unfortunately, he's very much dead, but it doesn't affect your questline in any way. Just return to Akama, and pick up the next quest. As the quest text mentions, bring the medallion to A'dal in Shattrath. Not much to say about this really, you get to chose one of six blue rewards for this quest.